One … enter NOW to win free coaching from My Mama Mojo! Don’t miss a chance to recover your mojo now that the kids are back in school, and fall is just around the corner … just comment here for a chance to win! Two … we’re not quite finished with our vacation after all, and are taking one more day to get home … look for a newsletter on Tuesday and hope your week gets off to a great start! It’s been a true getaway with hardly any time “plugged in” and it’s been wonderful. Would You Like Some ... Daily Sunshine and Giveaways? My SIL showed me this site the other day, and I love it. It’s called the Brightside Project, and the premise is simple. One giveaway, every day of the year. All items are donated, and the giver gets to decide who recieves the prize based on the answers! (There’s always a question). You do have to stay on top of things and claim your prize within a week, or it slips into someone else’s fingers. Their choices are tasteful, lovely things for home and you and life. Need a little sunshine? Check them out! Last Call : Don't forget to enter! The Q of the Week contest is closing at midnight tonight, pop over here and answer the mini meme and you’re automatically entered … thanks for playing!! I’ll pick a random winner tomorrow and post the results on Monday. Have a great weekend! 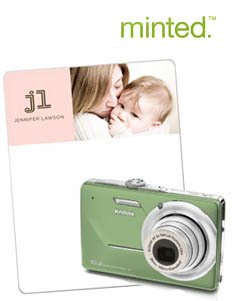 Win a Kodak Camera & Photo Stationary from Mothercraft! Giveaways from 5 Minutes for Mom : Great Mother's Day treats! Who wouldn’t want a new Coach purse? Five Minutes for Mom is giving one away , and it’s worth a shot, check it out! I’m a self-professed bag lady, who travels in 2nd-hand style most of the time. I love me my bags though :). Click here to go to 5 Minutes for Mom’s Giveaway! Our electric bill is horrid, in my estimation, given the fact that we live in less than 1000 square feet, we have one computer, no tv, and very few electronic “toys”. I have to admit my husband is addicted to 100 watt bulbs, in everything, and leaves lights on ALL the time which drives me nuts. SO when I saw this giveaway for a Belkin conserve-power-surge-protector, I promptly entered :). I’ve loved belkin products before, and think that a remote control to turn off everything that uses standby power is super cool. And the estimation that you can save 15% on your electric bill was a turn-on for me. Enter to win yours here at Cheeseslave! Too cool. Lower bills helps keep ME sane ;). I promised this announcement Friday, and didn’t deliver, sorry about that! Here we finally are with the contest results from the SaneMom Birthday contest. Remember the prize was a hand-bound journal and a voucher for 4 Free Individual Coaching sessions with me, the SaneMom Coach. The names were all written on slips of paper, and Fynn obliged by being my name-drawer. He drew one slip of paper out, and then waved it around and made it almost impossible for me to get a picture of it …. If you can email me your address asap (or the name/address of whoever you want to get the prize), I’ll get the package out to you! Happy Holidays to you all, may they be joyful, comforting, blessed, and calm! In Contest Alert, Question of the Week : Winners, oops! Today is SaneMoms.com’s first birthday! Thanks to all of you who’ve come along for the ride, it’s been an enjoyable year and I’ve loved reading every single post you’ve shared and am glad for the company in my own quest for sane motherhood. I often wonder if I should have named it INsaneMoms.com instead! We have a great Birthday giveaway!! I’m offering a chance to win one of my SaneMoms Holiday Gift Paks to anyone who leaves a comment on this post. That’s 4 one:one coaching sessions by phone, plus a handbound journal to keep your thoughts in, from The Sane Mom Coach. You don’t even need to be a member! Just click the Comment button below and leave a note of some kind. It would be great if you let me know what would make you post more often :). Get rid of logins and allow anonymous posts? Go back to the old forum? Have more news-current-events related questions? Any feedback appreciated, but if you just want to leave a “Hey I’m In” comment that’s fine too! DEADLINE: THURSDAY DECEMBER 18th at MIDNIGHT! (EST). Get those posts rolling, let your friends know about it, and I look forward to picking a random winner! The shorter-than-usual deadline is a birthday present to myself, as I turn thirty-eight on Thursday :) Let the comments roll! Work-it, Mom! is having a week-long celebration to mark their first anniversary, and they’re giving away cool daily prizes. Check it out! Today’s gift is a $100 gift certificate to Bare Necessities, which certainly wouldn’t hurt the look of my underware drawer … take a peek (at the contest, not my drawer! Scary sight that is :).